It just so happens there’s a reason people own Apple products. If there’s a universal truth, it’s that people just want their stuff to work. No mess, no fuss. No one wants to know how their stuff works, they just want it to work every time, like it did the last time. No one really cares how it works — I mean, there’s only so many hours in the day. You could probably point to a dozen or more household appliances that few people could explain the inner workings of. Do you know how your fridge works? Do you know how an oven gets hot? Or how an induction cooktop generates energy? Most people have no idea. And why? I’m not entirely sure myself, but there’s no reason to care how your microwave heats up your food, just so long as it does it every time you want it to. Magnets are probably involved somewhere in the process, but how many times will I have to take apart my microwave to fix it? Unless I suddenly get a job as a microwave repair technician, none. Zero. Nada. Which is why projects like dd-wrt exist. DD-WRT, for those playing at home, is a totally custom router firmware that includes everything but the kitchen sink. The interface isn’t spectacular, but it’s packed to the gills with functionality, and provided you have the right kind of router to run dd-wrt on, you’re all set. Only a router-specific installation procedure to follow, a few harrowing moments when you might think you’ve bricked your new router, and boom — you’re running the arguably the most powerful third-party firmware out there. I’ve always been curious about dd-wrt. I learned about it back in high school, I think, and I’ve wanted to play around with a dd-wrt compatible router ever since. I’ve never really had any real need for one, mind you, but it would have been cool to tinker. Just ‘cos, you know? As it happened, I bought a Nintendo DS lite a little while ago for some old-timey DS games. (OK, Pokémon. But I’ve played other games, too!) The best thing about the DS lite is that it’s the best one available if you want the best combination of backwards-compatibility and, uh, homebrew media; it has an old-school GBA slot for Game Boy Advance cartridges, and with an Acekard or similar, you’re all set for just about any GBA or DS game you could care to name. It’s even better with a flashable GBA card for, uh, homebrew GBA games, but we’ll leave that for another time. But the worst thing about the DS lite is that it only supports Wi-Fi networks with no encryption, or WEP. Now, I don’t know if you know, but WEP is about as secure as locking up your house with sticky tape. A miniscule deterrent at the most, and a mere inconvenience for anyone actually wanting to see what’s happening on your network. Which brings us back to dd-wrt. You see, dd-wrt has a cool feature where it can broadcast multiple SSIDs if you have the right hardware. Each of these multiple SSIDs can have their own security settings, and if you really want, you can also choose to route traffic from each of the WLANs separately. Pretty cool if you have your CCNA cert, but otherwise just a hindrance to get some real stuff done. Anyway, one thing lead to another, and just for fun, I picked up an E4200 wireless router to play with. I saw an Engadget article on the E4200 years ago, and I’ve always wanted one. Not really sure why. After a moderately complex installation process (are all those 30-30-30 resets really necessary? 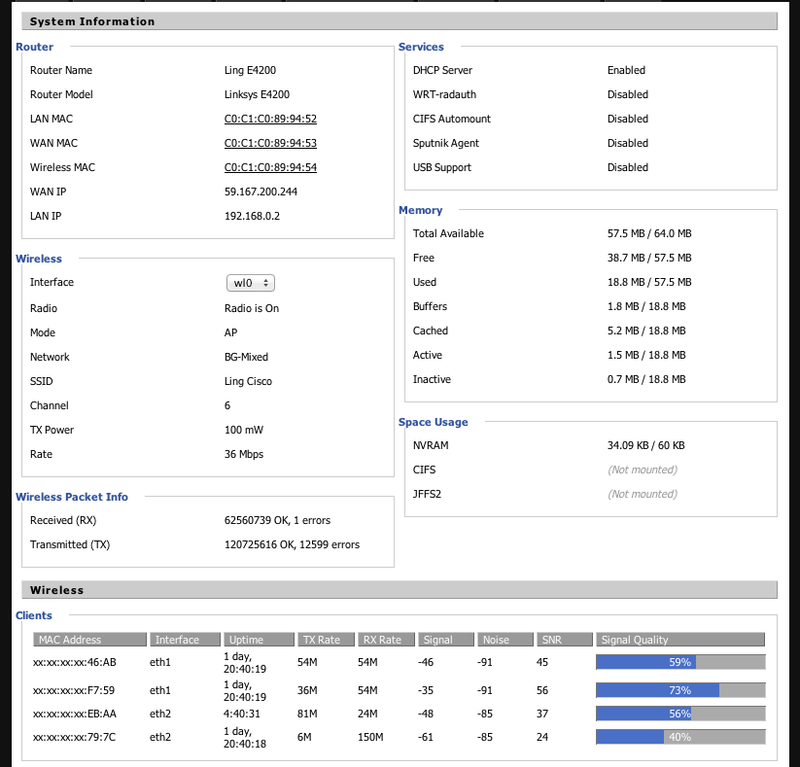 ), I had dd-wrt up and running on my E4200. That was when the real fun began. Don’t get me wrong, I really like being able to configure stuff. I like having options for turning radios on or off, or even being able to control the transmission power, in milliwatts, of each of the individual wireless radios, but man, I wasn’t kidding around when I said you needed a CCNA cert to understand a lot of this stuff. There’s all kinds of firewall configuration stuff, DNS-related shenanigans, and all kinds of other miscellaneous doo-dads. Ever wanted to configure, manually and with only a textbox to call your friend, your own firewall rules? dd-wrt doesn’t just allow you, but it actually encourages you. Insanity. I didn’t grab a screenshot of some of the more arcane wireless settings, but you kind of get the idea. Heaps of info, but how much of that is actually useful? Long story short, after a few days’ worth of Googling I managed to get it all up and running. I had three WLANs: one for 2.4GHz (b/g) stuff, another for 5GHz (a/n) stuff, and a virtual WLAN on the 2.4GHz radio specifically for the DS lite. Don’t tell me I don’t take my Pokémon seriously. Surprisingly, it worked pretty well. But, other stuff didn’t. The Belkin WeMo I have for turning my heater on and off according to a schedule and controlling from my iPhone (the future!) would not want to connect to any of the wireless networks for whatever reason, but that could have just been WeMo flakiness rather than anything else. The dd-wrt router also didn’t want to play nice with my ADSL modem (no NBN connection at the time — more on this in a second), and instead wanted to do all the PPPoE and routing. Previously, I had let my modem do the modem-y business and let my 3rd gen AirPort Extreme do all the routing, but little old dd-wrt wasn’t really happy with that. So I had to reconfigure that. Again. A few weeks later, I had everything set up exactly as I wanted it. The WeMo had finally decided to connect, after blindly adjusting some non-sensical value, my WLANs were all working as I wanted them too — the WEP network only had internet access, no access to the local network whatsoever — and I was pretty happy. Then, just when I thought everything was just as I wanted it to be, we got the NBN connected. Another long story short, the E4200 just couldn’t handle the megabits that the NBN was throwing at it; despite the fact that it had a Gigabit WAN port, I was only getting about 77Mbps on my 100Mbps connection when using the E4200 as my router. More info in two posts over on OCAU, if you’re interested. Somewhere between adjusting the ACK timing and making a bridge so my WEP network only had internet access — or it might have been when I was using a custom DNS implementation, I’m not sure — I realised there might be something about the simplicity of Apple products. As an aside, I love all the times it just has a question mark in the “how it works” sections of the advanced wireless settings page on the dd-wrt wiki. The next day, I went and bought one of the new AirPort Extremes, the taller ones. 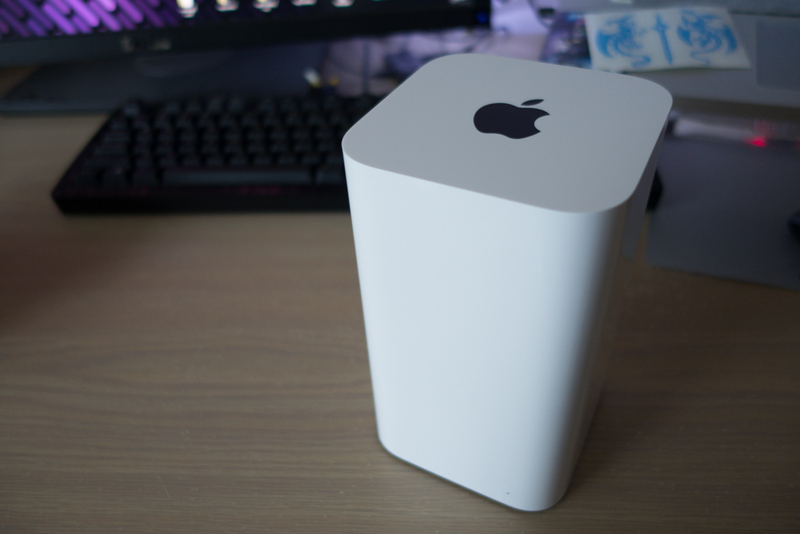 Setup was completely hassle-free, and besides a small hiccup with wireless passwords and DNS — for some reason, my server decided it didn’t like connecting to the internet any more — everything has been running smoothly ever since. Ever wanted to know what it’s like to own an Apple product? At times it’s a lot like what The Oatmeal describes it as (I’ve wanted a new Extreme for a while now, if only for the guest network feature), but other times, it’s simplistic bliss. Like, stuff just works, you know? I’m glad I messed around with dd-wrt. I’ve checked that off my bucket list, we’ve had our fun, but now it’s time for a home network that actually works when I want it to. Plus, the 802.11ac wireless will come in handy when I get some new hardware, not that I’ll ever stop preaching the benefits of wired Gigabit ethernet connections. Correction: an earlier version of this article originally stated that the release date of Pokémon X and Y was in three weeks. Unfortunately, the official release date of X and Y is October 12th. Punitive action against the author of this heinous error has been retroactively applied.